The Postmortem Donation of Cardiovascular Tissues. Sammelband von Birgit Wulff, Klaus Püschel, Theo de By, Roland Hetzer (Hrsg. ), Verlag Dr. Kovač 2012, 152 S.
The patients’ demand for human cardiovascular allografts cannot be met at the present time. Enhancing public discussion on donation and closing the circle between the altruistic donor and the recipient is one of the major challenges in tissue donation today, as well as diminishing the loss of tissue during the process from donation to banking. 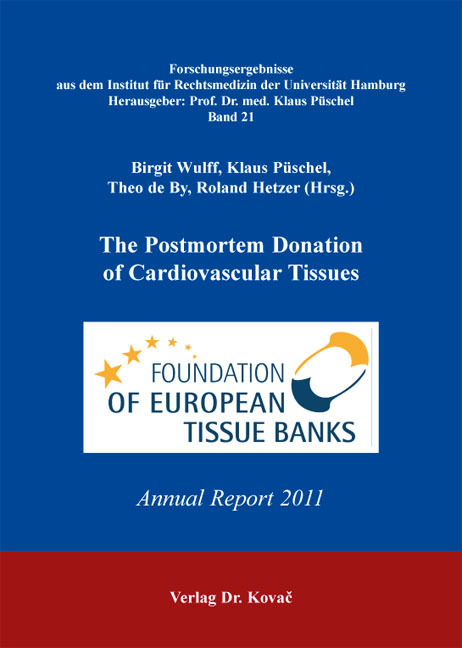 In this second annual report 2011, the Foundation of European Tissue Banks presents the scientific and organizational efforts to improve the supply of cardiovascular tissues. Faszinosum Spürhunde – Quo vadis?